As the old saying goes, ‘it’s not how you start, it’s how you finish’ and that is exactly what the #4 Seward County Lady Saints followed Saturday afternoon in a matinee affair in Garden City’s Perryman Center. After a slow start that saw the undefeated Lady Saints tied with the 7-9 Broncbusters after one, Seward found their rhythm, stepping on the gas to take a nine point lead at the half before blowing things open in the second half to win 75-53, improving to a perfect 17-0 on the year. On an icy afternoon in Southwest Kansas, both Seward and Garden started cold with the two trading turnovers on their first four possessions. It took over two minutes before either team scored and it took until almost the midpoint mark of the first quarter before Seward found their third field goal of the game as they led 8-5. Garden went on an 11-1 run to erase the Seward lead and take a seven point lead of their own, but the Lady Saints roared back, knotting the score at 16 after one quarter of play. The Lady Saints came out in the second a little bit more ready to go, scoring the first five points of the period to finish off a 12-0 run to take a 21-16 lead. Seward continued to push, stretching their advantage to nine at 30-21 and each team picked up another bucket before the half as the Lady Saints stormed to the locker rooms ahead 32-23. Seward shot just 38% in the first half, but held Garden City to 27%. Seward forced 11 Buster turnovers in the half, giving it up nine times themselves in the process. Joanna Grymek led all scorers with seven first half points while also making her mark on the defensive end with four blocked shots. Garden City came out of the locker rooms at half with their hair on fire, stopping Seward on their first to trips down the floor while scoring on both of theirs to trim the Lady Saints lead to five. Seward responded by going on a 12-3 run, quickly opening up their lead to double digits at 44-30 with 4:06 left in the quarter. 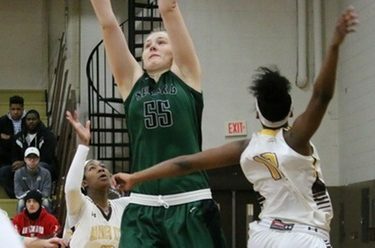 The Lady Saints eventually finished off the third quarter by outscoring the Busters 19-10, doubling their lead into the fourth quarter to 51-33. The Lady Saints didn’t let up, extending their lead to its largest of the game at 67-41 midway through the fourth before putting things in cruise control to finish off the Busters 75-53 to finish the first half of Jayhawk Conference action unbeaten. Seward shot 50% from the field in the second to finish the game at 43% overall while Garden City shot 33% in the half to push their game total just over 30% for the afternoon. Grymek scored a game high 17 in the win for Seward while also rejecting five Garden City shots. Mollie Mounsey added 15 while Manuela Fungate pitched in eight points and eight rebounds in 14 minutes of work off the bench. The Lady Saints go through the first round of conference play still unbeaten, improving to 17-0 overall and 13-0 in league action. Garden City continues a disappointing campaign, falling to 7-10 overall and 5-8 in conference play. The Seward win sets up a showdown on Wednesday in the Salt City as the 4th ranked Lady Saints travel to Hutchinson to take on the 6th ranked Lady Dragons to kick off the second half of conference play. Seward and Hutch will tip at 5:30 from the Hutchinson Sports Arena.